For the marquee player, a marquee basketball shoe. The adidas Pro Model '08 Team Color rocks a new-school shell-toe style, a high-gloss patent leather finish, interchangeable stripes, CLIMACOOL® ventilation and adiPRENE®+ forefoot propulsion. CLIMACOOL® provides 360-degree cooling for the entire foot. 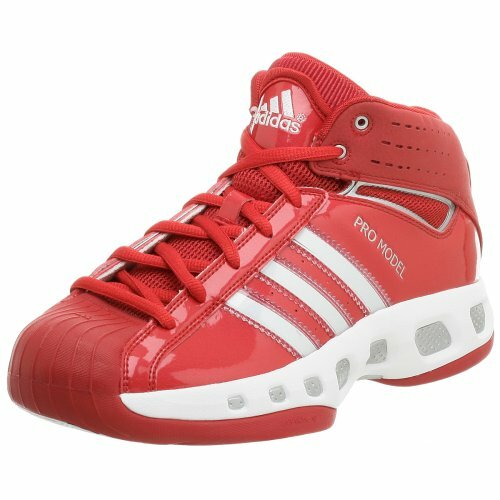 Synthetic patent leather upper for durability and high-gloss finish; Interchangeable 3-Stripes for custom color. adiPRENE®+ in the forefoot maintains propulsion and efficiency; Perforated EVA tongue for lightweight comfort and breathability. A FitFOAM? midsole, made of a visco-elastic rebound foam, contours to your foot like a custom mold. Textile lining for comfort. Non-marking rubber outsole.